The HR Review system was a large, multi-stage project undertaken by the apps development team I was a part of. We broke it down into a few discrete phases which started with a thorough analysis of the existing performance review system. I created a process diagram to document the functionality of the program and to give us a basis for the flow of the new system. With this mental model of the review process we initiated regular meetings with the HR team to find out what they liked and didn't like about the current system. 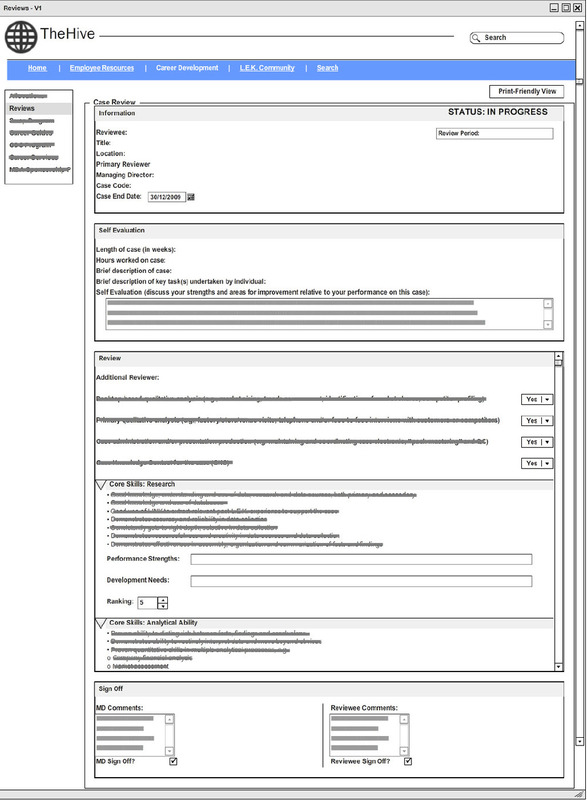 With this information, my teammates set to work researching the best way to implement the new system on SharePoint and I set to work designing a few wireframes showing how it would look. Months of iteration later we had a working prototype and the HR team took charge of performing some user testing with a few of our users. The last image below is of the system once it was launched in production.